Since it was so much fun doing the Horrortoberfest reviews last month, I’ve decided to keep on just doing movie reviews from now on, though on a once a week basis instead of once a day. Also, as evidenced by my pick for this week, it won’t be solely focused on the horror genre. It remains to be seen whether I will stick to the rule I had for Horrortoberfest about not reviewing movies I’d already seen before but, for now, I’ll try to mix it up with some current release and some older movies (most likely ones you can stream on Netflix). Anyway, on with the review. 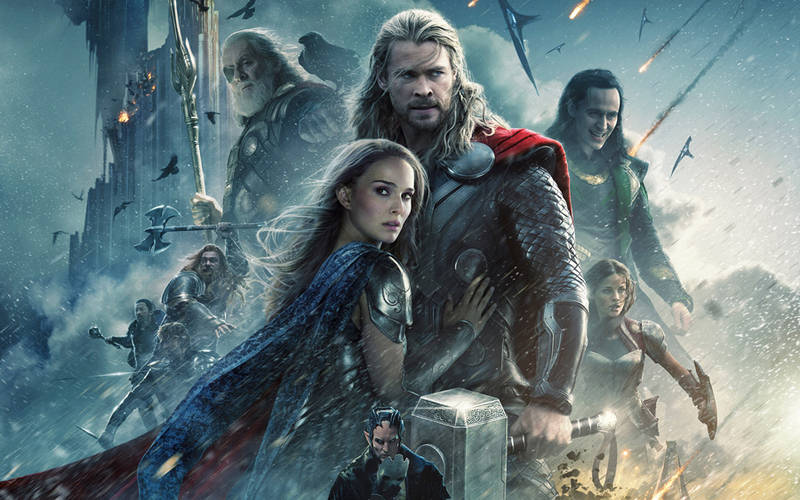 Thor: The Dark World picks up two years after the ending of the first Thor movie. Thor is trying to undo the damage to the Nine Realms that Loki caused with his shenanigans and Jane Foster is on earth doing science stuff that is never really explained beyond “something to do with gravity fluctuations maybe?”. The movie continues the trend from the first of having female characters that aren’t only useful as accessories to their male counterparts. When we see Jane for the first time she is actually out on a date instead of pining for Thor and only leaves when called to do important science work. Actually, come to think of it, every female character in the movie gets shown as being competent if not downright badass in most cases. Frigga, Sif, Jane and even Jane’s intern Darcy returns and is shown to not only have picked up the slack in the science department but is bossing around a young male intern of her own. The main villains this time around are the dark elves led by Malekith and his right hand man Algrim/Kurse. The elves are super angry because in their day there was no day and they liked it that way by gum so Malekith is going to plunge the universe into darkness using liquid darkness during the Convergence when all the realms are aligned. It’s only slightly less stupid than I have made it out to sound but nobody ever accused elves of having the best planning capabilities. However, most of the grim dark obsession of the grim dark elves can be forgiven because they have super sweet costume design and their ships are neat. If you play Warhammer 40k then you will recognize them as totally being the Dark Eldar from that and also I am so sorry that you are playing Warhammer 40k. The first step is admitting you have a problem. The set design is beautiful in this and it’s wonderful going from the majestic golden Asgard, to the barren rocky wastelands of Svartalfheim, to the cheap-to-film-in streets of London. Pretty much everyone is a delight to watch, acting wise, with Tom Hiddleston’s Loki remaining one of the most fun characters whenever he is allowed to interact with other people. The action sequences are high energy but I also enjoy them for 1) being able to follow the action instead of the blurry, shaky cam fights of Batman and 2) the hits look like they are mighty blows being struck instead of just dudes punching each other. Which isn’t to say that the movie isn’t without its flaws. A lot of the humor seemed to fall flat and even some that did get a laugh out of me tended to be pretty cheap jokes like “This dude isn’t wearing pants.” Also a lot of the actions of the dark elves were kind of stupid but they have to be all menacing and evil instead of just winning. In all, I definitely enjoyed the movie. My biggest gripe was that they left Hogun on his home realm of Vanaheim after the first scene but neither of the other Warriors Three had to go do stuff off screen. “Sorry, Asian guy, we have no room in the movie for you.” I can only hope that it was done to set-up him doing something awesome in Thor 3 because otherwise it was just pointless and stupid. That being said, I would give this a 4 out of 5 and recommend it to anyone that enjoyed the original Thor or just likes comic book movies in general.